I will be heading West soon, to visit family and help my Mom with her life changing plans. My laptop is staying home. Dr. Von Threadmore's plans to attend the Palmetto Tatter's Guild's Tat Day 2012 have been postponed to 2013. This is mostly my mishap, I neglected to inform the good ole Dr about the dates and other important information for applying to teaching. I really appreciate the generosity of the contributors thus far. I am going to keep going with the fund raiser for Dr. Von Threadmore and hope that it will be successful for her to attend the PTG's Tat Days 2013. Then purchasing the airfare early will be less costly! If any of you have any blog(s) and desire to blog about this cause, please email me to discuss this. I will toss in either a skein of HDT or one of my "ONS" as my thank you. I shall be back home sometime in June or so. ... Trimming Down My Usage on Facebook! It is amazing of how much time passes you by when you are not paying attention. It seems that two years have basically flew by me without much thought. For the past month or so, I finally took a serious look at my home with open eyes. It is disorderly...pretty bad. It got that way because I allowed Facebook's games to take over and monopolize my time. It was time to say for me to say to self, "Enough IS ENOUGH!" It was time for me to get back to the things that I love doing, to stop using things that sucked away my time, to manage my time better... for my self and for my health. I guess it is possible to say that I have been in state of denial... not of drugs or anything like that but of life itself. Yep! It was Saturday yesterday, which meant another trip to pick up my share of the harvest for the week! 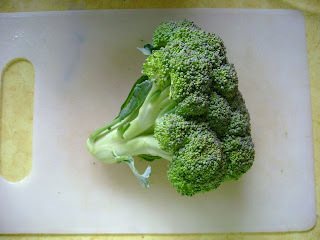 This week's list of yummy and healthy food included Tuscan Kale, Zucchini, Fennel, Swiss Chard, Broccoli and Kohlrabi. Heh? What the heck is that, you ask? Well, Kohlrabi is a member of the brassica family, whose nutrient-dense cabbages (as well kales, brussel sprouts, broccoli and cauliflower) are highly regarded for their antioxidants properties. You can eat them raw, just peeled, sliced and added to a salad, but they are also delicious cooked and are often used in stir fry (info provided by Taylor Creek Farm). I also googled Kohlrabi to find the pronunciation of it. "cole-rah-bee" I also learned that it is a german turnip! Sooooo ...what did I do with my German sputnik looking turnip a.k.a. Kohlrabi? I stripped off the leaves and cut it in half. I also used my veggie peeler and peeled the outer thick skin. Sure, I have eaten many salads in my life time and loved most of them. The difference in local farm freshness and produce shipped from who knows where is amazing. As I was preparing last night dinner, I tasted each item before using them in the salad. I was tasting new flavors like the kale, the fennel, the greens from the beets. Even the lettuce had a burst of flavor! Lets not forget the aroma! 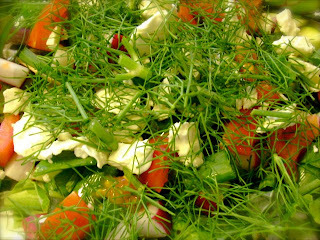 My nose was smelling the perfume of the fennel and radishes. I added the tomatoes which did come from my grocer and made sure it was "Product of USA". These were fine but when it is the season for local tomatoes, I'll be on cloud 9! If there was only one vegetable that I had to choose from to live on the rest of my life, it would be the tomatoes! Yes, I am aware that they are actually "fruit" but I don't care! A Picture worth many descriptions! My mouth was in a state of euphoria last night! ...We Went to The Farm! That is right! To the farm we went. Taylor Creek Farm that is! It was a beautiful morning to go the farm. The sky blue. The sun shining. What more could I want? Well, I want fresh grown produce to take home. I want to eat locally grown, healthy food! 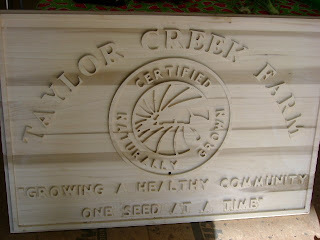 I want to do my part to improve the local economy by supporting the local businesses like Taylor Creek Farm. Speaking of Taylor Creek Farm, Please meet Michelle and Chuck! They are some of the wonderful people in my community. I had the pleasure of meeting them last year. They grow everything on their farm naturally. I managed to buy and eat some of their produce. I was not disappointed in anything that was purchased ...but, (yep a but!) when I arrived last year, they were mostly sold out. That is very exciting for Michelle and Chuck. Here on their table is a sampling of what they had ready for harvest this week. Okay! Okay! We did go to the farm but not the farm! Huh? We went to our local Farmer's Market! It was opening day today.